5G in BTC City Ljubljana • BTC d.d. 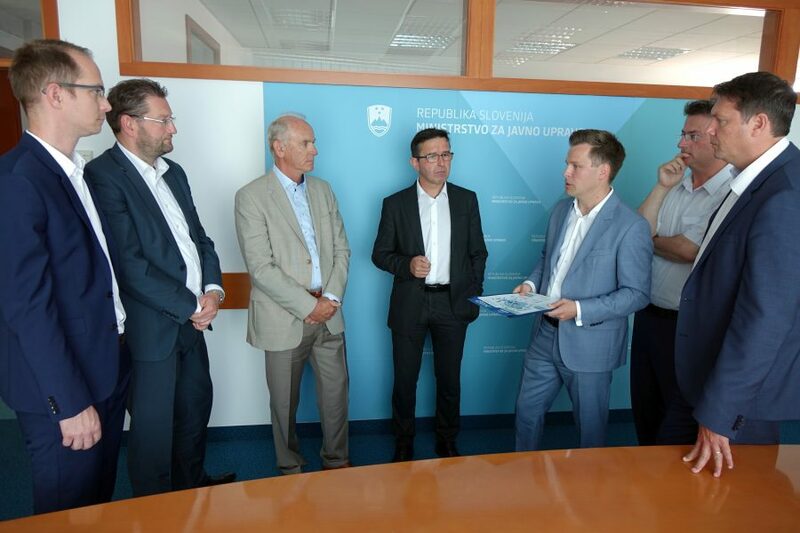 Today, the Agency for Communication Networks and Services of the Republic of Slovenia (AKOS) in the presence of the Minister of Public Administration, Mr Boris Koprivnikar, awarded the BTC Company the use of frequencies for testing 5G network technology and implementation of R&D projects in the area of the BTC City Ljubljana. In 2017 AKOS, in cooperation with the Ministry of Public Administration and under the initiative of the European Commission, announced the Slovene 5G initiative and called to the submission of projects for testing and future use of 5G technology. The BTC Company with its subsidiary AV Living Lab accepted the opportunity as they are developing an ecosystem for testing connected and autonomous vehicles in the area of the BTC City Ljubljana. “In implementation of the fifth generation mobile technologies Slovenia is among the leaders in Europe. We are aware that by introducing modern IT infrastructure we will attract the most innovative companies, therefore we are among the first to enable the acquisition of frequencies for testing of 5G networks. The automotive industry is thus recognising Slovenia as an environment favourable to development. In the field of digitalisation we are transforming from the followers to the trendsetters. In the field of 5G fast networks we will not wait for standards, but will actively participate in their development,” said the Minister of Public Administration, Mr Boris Koprivnikar. 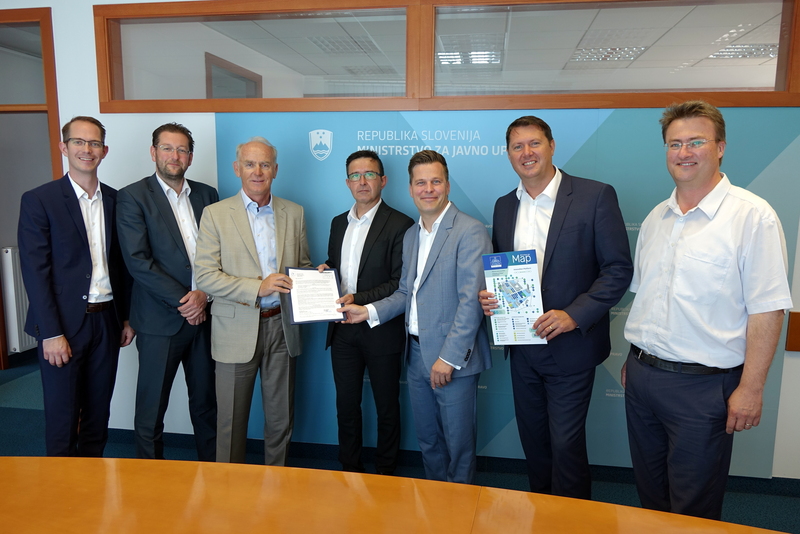 BTC City Ljubljana by the acquisition of the frequency bands (703-733 MHz, 758-788 MHz and 3410-3800 MHz), which enable the testing of loT devices and mobile technologies of the fifth generation, is upgrading the ecosystem for development of solutions and technologies for autonomous AV Living Lab vehicles. The test frequencies will enable demos and pilot projects with 5G technology focused on testing of autonomous vehicles, vehicle-to-vehicle communication (V2V), vehicle-to-roadway infrastructure communication (V2I), and vehicle-to-pedestrian communication (V2P). This infrastructure will also provide testing opportunities for projects from the fields of smart city, smart energy networks, blockchain technologies, and others. “The acquisition of frequencies for testing 5G technologies represents an excellent addition to the existing AV Living Lab ecosystem, which is comprised of the infrastructure and content of the BTC City Ljubljana, numerous visitors and partners,” pointed out Mr Jože Mermal, the President of the BTC Management Board. “The test frequencies will be used with R&D projects that will explore the opportunities and challenges of 5G technology – performance of different facilities in the urban centres, vehicle-to-vehicle communications, communication with devices, and widespread use of the IoT devices,” stated Dr. Radovan Sernec, Director of Innovations & Technology at AV Living Lab. The 700 MHz frequency band was granted for the period until January 2019 and will enable machine-to-machine communication (M2M), internet of things (IoT) in smart public and private networks, especially energy grids. These devices send smaller amounts of data at one time, but create large amounts of cumulative traffic. The 3.4 to 3.8 GHz band was granted for the period until May 2021 and will primarily be used for cellular technology and solutions. It will enable speeds of up to 10 Gbit/s and low-latency. Autonomous vehicles will thus acquire real-time information about road conditions and would operate as always connected computer on wheels, while users will be watching video on demand in best quality. Slovenia is actually becoming a Green reference country in digital EU, since it has an excellent digital structure and conditions for installation of test pilot structures, and it facilitates testing of new user examples from the field of 5G technologies. This is also reflected in the fact that in 2017 the European Commission declared Slovenia as the fastest growing digital society in EU; in 2018 we gained two more places on the Digital Transformation chart.